This makes so much sense it’s scary. A $200 computer, by Google, on sale NOW at WalMart that leverages the power of the Internet with browser-based and open source software (thus no “Microsoft tax”). I might just be geeky enough to go out and buy one. We’ll see. Meanwhile, click here for details of the Everex gPC as covered by John Biggs in the NYTimes. 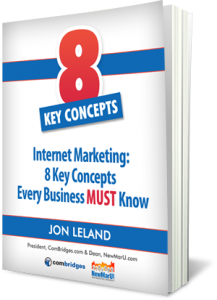 http://www.combridges.com/wp-content/uploads/2017/06/ComBridges-Logo-300x60-300x60.jpg 0 0 JonLeland http://www.combridges.com/wp-content/uploads/2017/06/ComBridges-Logo-300x60-300x60.jpg JonLeland2007-11-02 12:05:002007-11-02 12:05:00Revolutionary gPC is a $200 Web-facing Computer with no "Microsoft tax"
We are way too early in this to be talking about blossoming, but the sprouts or seeds that are the revolution of the advertising business going totally digital, totally accountable, totally targeted and totally interactive are HUGE! I cover the basics in my internet marketing ebook, and today’s New York Times covered how Microsoft is trying to catch up with Google in this arena. This is a good article packed with perspective. Hey, isn’t this the guy who runs a software company that sells more software (and software upgrades) than any other company on earth? In other words, free ad-supported digital media will rule, and digital advertising will blossom into channels of humongous proportions… proportions that make Google as it exists today seem small. Bottom line, they all agree that it’s ALL going digital and this will change everything. Personally, I’m interested in building an advertising “on-ramp” for small businesses… A web application platform that would guide small business users so that they could leverage the advantages of the new media & advertising world. This is seriously needed by millions of small companies. Like I’ve been saying for years, we need communication bridges spanning the grand canyon gap between people and technology… Anyone want to play? 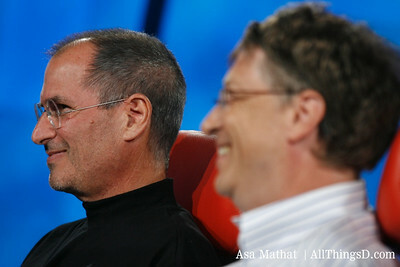 I don’t think there are two better visionaries on the planet (of course, I’m partial to Steve Jobs), and while their joint appearance with Wall Street Journal’s Walt Mossberg was covered in the news, I just discovered the complete coverage including transcripts and video clips (an edit of video excerpts is included below). Good stuff! There are many ways to look at the launch of Google’s new Apps platform, but for me, it looks like a pretty cool and very low cost ($50/year/user) way for a small business to do a web site without traditional hosting, and with a bunch of neat features. Because it supports direct domain (as well as sub-domain) hosting and includes integrated e-mail as well as a bunch of features (from Google Page Creator for creating web pages to calendars and other forms of collaboration), it’s quite powerful. More info here specifically for small businesses. I think the biggest challenge will be having small businesses understand the scope of what’s being offered. On the other hand, the bigger business story for larger enterprises and the broader IT market is that Google is Challenging Microsoft (NYTimes) with a service that offers email and more for $50/user vs $225/user annually using Office and Exchange.